Wednesday, May 15, 2019 - 7PM - 9PM. 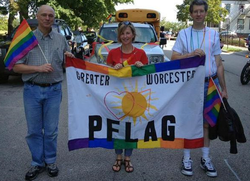 PFLAG of Greater Worcester is for you!!! Music video about acceptance, diversity, inclusivity. "We are here in giant numbers going places unencumbered. Gentle souls of every hue, GLBTI and Q..."
PFLAG of Greater Worcester is a local chapter of the national organization PFLAG - Parents, Families and Friends Lesbians and Gays. We, the parents, families and friends of lesbian, gay, bisexual and transgender people, celebrate diversity and envision a society that embraces everyone, including those of diverse sexual orientations and gender identities. Only with respect, dignity and equality for all will we reach our full potential as human beings, individually and collectively. PFLAG of Greater Worcester welcomes the participation and support of all who share in, and hope to realize this vision. PFLAG of Greater Worcester promotes the health and well-being of gay, lesbian, bisexual and transgender people, their families and friends through: Support, to cope with an adverse society; Education, to enlighten an ill-informed public; and Advocacy, to end discrimination and to secure equal civil rights. PFLAG provides opportunity for dialogue about sexual orientation and gender identity and acts to create a society that is healthy and respectful of human diversity. Support: We provide a safe, confidential space where all people can come to give and receive support. Education: We educate each other and work to educate the public on issues relevant to the lives of lesbian, gay, bisexual & transgender people and the people who love them. Advocacy: We tell our stories, and through those stories, the stories of our loved ones, in public and political forums -- sometimes because our loved ones cannot speak out on their own behalf, or because they are not heard.